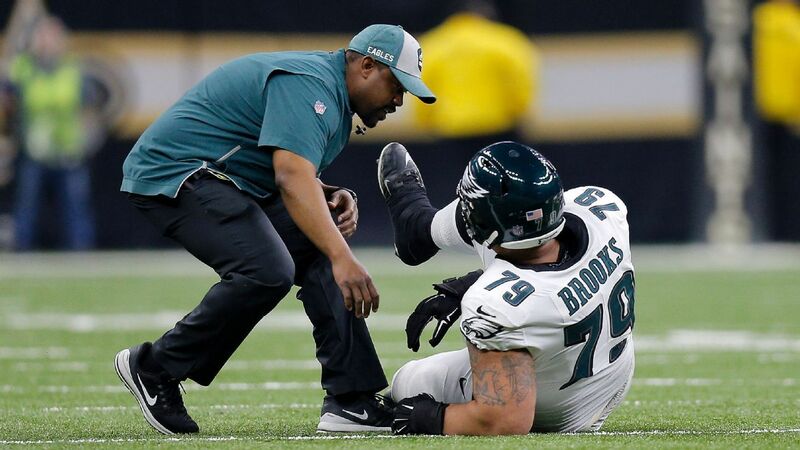 NEW ORLEANS — Philadelphia Eagles Pro Bowl right guard Brandon Brooks has been ruled out of Sunday’s divisional-round game against the New Orleans Saints after suffering a right leg injury in the first quarter. Brooks went down on the Eagles’ second possession of the game following a Nick Foles throwaway. He tried to walk off under his own power but did not make it all the way to the sideline. The entire Eagles team came out to console Brooks as he was placed on a cart before being driven into the tunnel. Brooks has made the Pro Bowl in each of the past two seasons with the Eagles. He was replaced in the lineup by Stefen Wisniewski.